Welcome to the world where the ice burns. Over the last decade, astronomers have discovered thousands of exoplanets, and it seems like each new discovery is a little bit stranger than the last. Take TrEs-2b, it’s a planet made of a substance that’s darker than coal. Then there’s Gliese 436 b (otherwise known as GJ 436 b). This alien world is located approximately 30 light-years from Earth towards the constellation of Leo. And it is made of excruciatingly hot ice. Gliese 436 b is a Neptune-sized planet that orbits a red dwarf known as Gliese 436, a star that is cooler, smaller, and less luminous than the Sun. The planet completes one full orbit around its parent star in just a little over 2 days. This short orbital period indicates that the planet is located remarkably close to its star, perhaps orbiting Gliese 436 from one-hirteenth of the distance between Mercury (the innermost planet in our solar system) and the Sun. Because of this close proximity, the planet’s temperatures exceeds 526ºC (or 980°F), which is hot enough to ward off water in liquid form. Yet, our current models indicate that a planet like this. which is composed mostly of hydrogen gas and has such high surface temperatures, should have significant quantities of methane in its atmosphere. Here is where Gliese 436 b gets weird. According to NASA, the planet has more than 7,000 times less methane than it should, and it has a surprising abundance of carbon monoxide molecules. And therein lies the second mystery — carbon monoxide should not be present to this degree, as it becomes scarce when temperatures soar above a certain threshold. The cause of this perplexing phenenenon is still unknown and, of course, the mystery of the missing methane still has astronomers scratching their heads. The Strangest Thing of All? Although the planet is Neptune in size, it’s too compact to have a complete hydrogen makeup (like typical gas giants); however, is not compact enough to be considered a rocky, super-Earth planet. Ultimately, astronomers think the planet hosts a large concentration of an exotic form of water-ice known as “Ice-x” on top of a rocky core. And this strange ice substance can remain solid despite blisteringly hot temperatures — we’re talking so hot, it could literally melt your face off … if you somehow managed to catch a drop of it in your mouth (if you’re wondering, human skin melts in water when it reaches 100°C/212°F). So, how water can remain solid at these temperatures? The immense gravity of the planet is strong enough to compress the trace amounts of water vapor in its atmosphere, keeping it from reverting back to its liquid form. In the years since Gliese 436 b was discovered, many new developments have come to light. 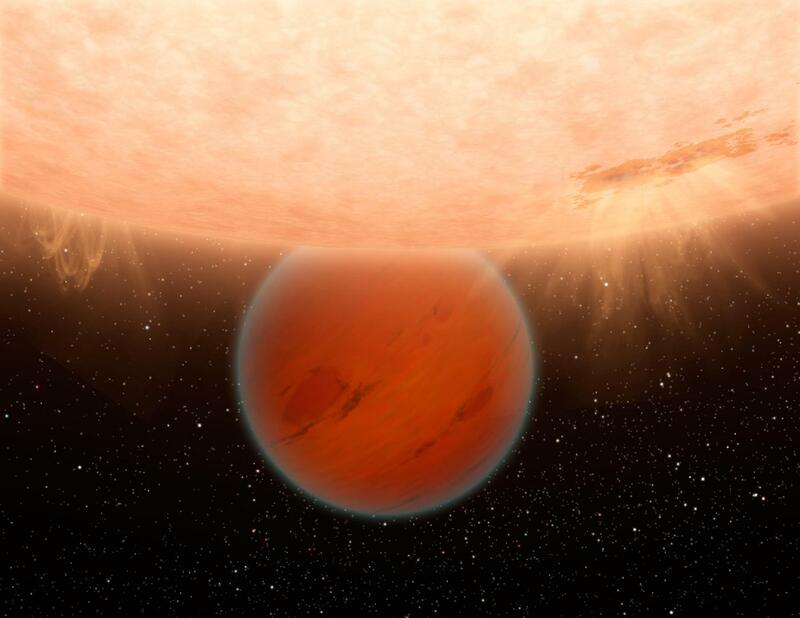 In a press release from the University of Warwick, a team of researchers revealed that some of the planet is evapotating due to pressures exerted on it by its parent star. 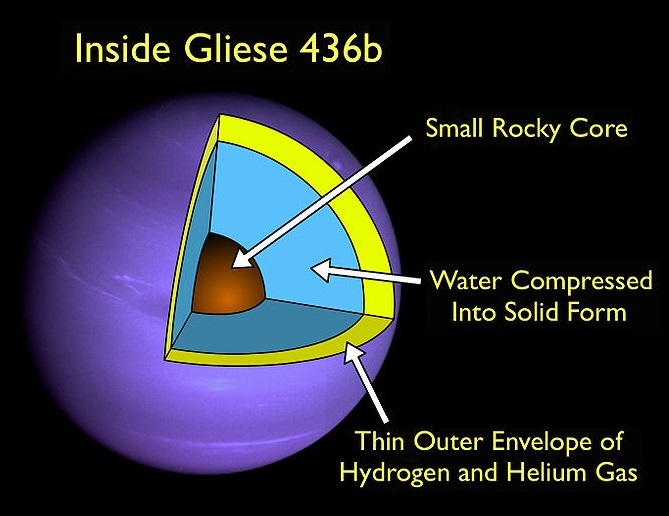 To understand what this means, we must go back to 2013, when a spectral analysis of Gliese 436 b proved inconsistent with other observations, suggesting it may have clouds in its atmosphere. By studying its transmission spectrum once more, the researchers from Warwick learned that a large cloud is situated between us and GJ 436b. This cloud, which presumably escaped from its planet’s atmosphere, is largely composed of hydrogen, and it continues to trail behind. Where Does Earth End and Space Begin?